According to the Post, NUT workplace reps and officers are facing a busy time as the reality of what Council schools funding cuts mean starts to become clear. They are holding 22 meetings over likely redundancies as schools start identifying how many staff they need to lose because of Swansea Labour's cuts. 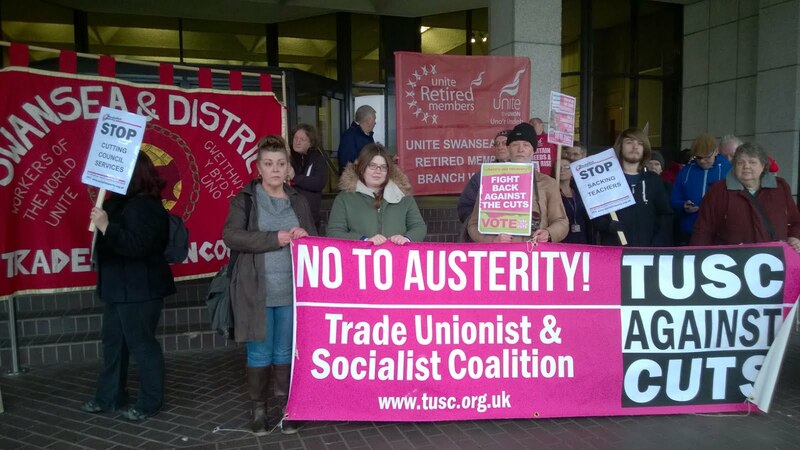 When TUSC supporters challenged Labour councillors over these devastating cuts to schools at the Council budget-setting meeting, Council Leader, Rob Stewart, said he didn't recognise the picture we painted of redundancies for teaching and other staff and increased class sizes. But when primary school heads were asked, by the Council, to predict the likely consequences of these cuts, they forecast that they would not be able to meet the statutory requirement to teach 5-7 year olds in classes of 30 or less and that, in some cases, older primary school students could end up in classes of 42+! And still Labour councillors claim to be "protecting education", although they do sometimes qualify it with the word 'relatively'. In other words, they're making deep cuts in education but they're cutting deeper elsewhere. If you're feed up with Welsh Labour representatives passing on Con-Dem cuts then what can you do to help TUSC in the General Election? 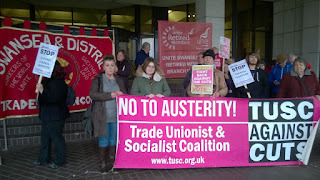 Vote for cuts or vote TUSC Against Cuts! Why should we pay for a crisis we didn't cause?